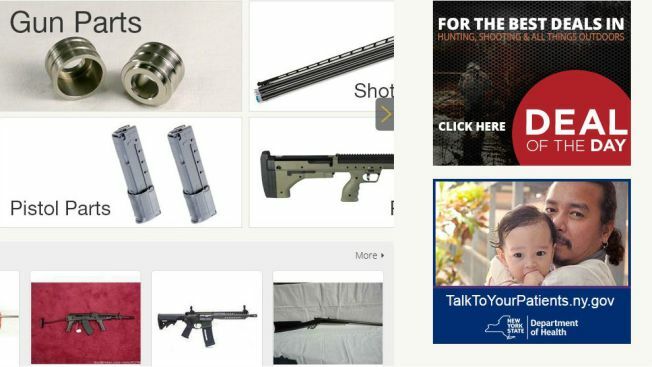 A screenshot from the website GunBroker.com shows a NY Dept. of Health anti-smoking ad running next to promotions for guns and gun parts. The New York State Department of Health is scrambling to explain how ads for its anti-smoking campaign appeared on a website that sells guns, Ku Klux Klan robes and Nazi paraphernalia. The campaign was placed on a digital advertising network, which in turn powers ad modules on the website GunBroker.com. When advertisers place ads on such networks, they are trafficked to dozens or even hundreds of sites, and the sponsors often do not know exactly where they appear. Nonetheless, the state said it was taking action to stop its promotions from showing on what bills itself as the world's largest gun auction site. "NYSDOH does not associate itself with anything promoting hate or violence. This anti-smoking media campaign was targeted to health care providers, and we certainly did not intentionally place ads on GunBroker.com," the Department of Health said in a statement. "We have paused the campaign, and have launched an immediate investigation as to how this could have happened." As the I-Team reported Thursday, among the current listings on the website, in addition to guns: a KKK officer robe “in pristine condition” for $350, a new KKK Gut Hook Neck Knife laser engraved with “Brotherhood of White America” for $36, and a new 3-foot-by-5-foot Nazi flag being for a mere $7.75. Calls and emails seeking explanation for the white supremacist merchandise listings have gone unreturned. The issue of ad networks, and the sites on which they appear, came to the fore last month after a major network banned the website Breitbart News. Breitbart, which was once run by top Donald Trump strategist Steve Bannon, was accused of violating rules on hate speech.